Most kids love getting down and dirty with hands-on activities. 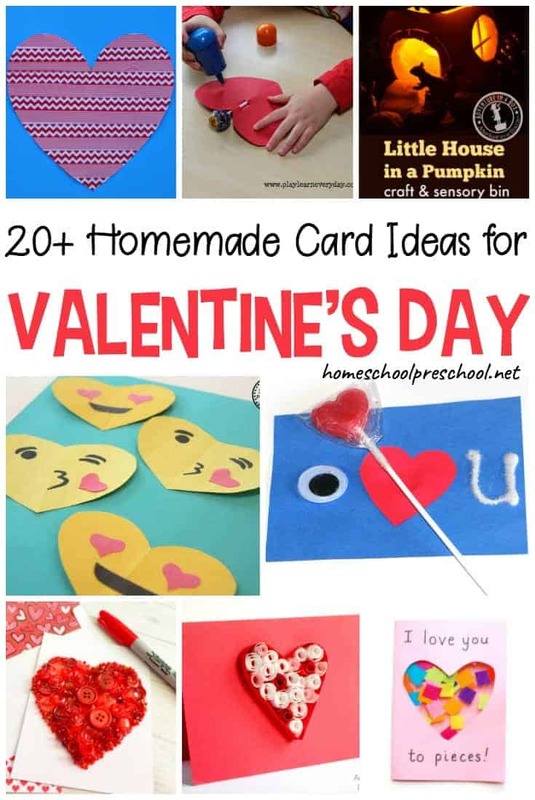 This Valentine’s Day, let your preschoolers make some slime, dig in a fun sensory bin, or make love potions for their favorite Valentine. These activities are the perfect way to let kids explore different textures. Let them help you mix and stir ingredients for slime or love potions. Introduce them to new sensory items with sensory tubs. Homemade Valentine’s Day Slime is a great sensory play activity for kids! It combines science and sensory in one fun activity. This Scented Sugar Sensory Tray will delight your young learners. They’ll love seeing the colored sugar, smelling the scented gelatin, and (if they’re anything like my kids) tasting the sugar on the fingers before the activity is over. 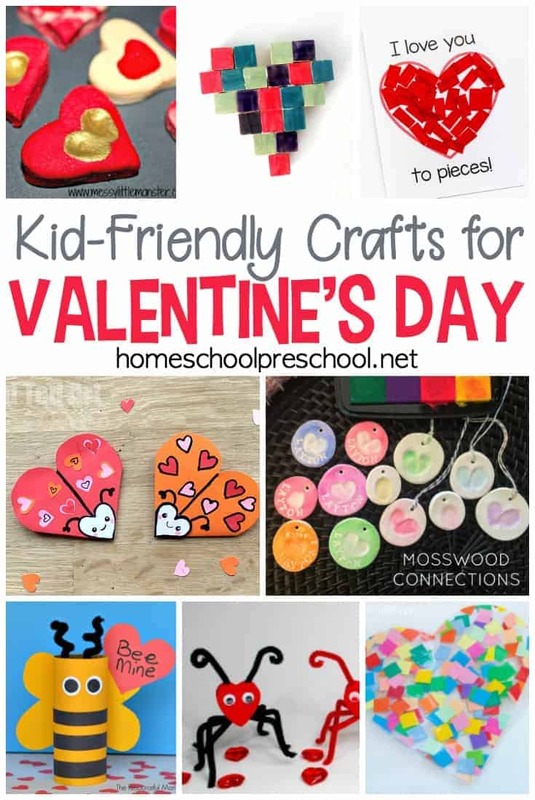 Set up a fun heart-themed invitation to play with scented playdough, playdough tools, and small items kids can use to decorate their Valentines. This Sparkly Valentine Slime uses just three simple ingredients. It’s simple enough for kids to help you make! Your kids won’t be able to contain their excitement when you set up this preschool Valentines sensory bin with frozen hearts. The magnetic hearts in this Valentine’s Day busy bag will help your kids develop their fine motor skills and hand eye coordination as they explore magnets with a magnet wand and pipe cleaner hearts. This Valentine’s Day Sensory Snow Globe is a cross between a snow globe and a sensory calm down jar. The best part is that it can be made in just a few minutes. You can put together a DIY Seek and Find Bag for Valentine’s Day. Kids can play “I Spy” when you need a few minutes of quiet. There are many ways to incorporate sensory play and gross motor skills when you set up this Valentine’s Day Water Play Table. Oh yum! Chocolate scented playdough is perfect for Valentine’s Day. Kids can work on their fine motor skills and creativity as they make cookies, chocolates, cupcakes, and more! This Valentine’s Heart Sticky Wall is a great open-ended activity that encourages movement and work on gross motor skills. Want an activity that doesn’t require tons of prep but provides tons of fun? This Valentine’s Sensory Bin can be assembled in no time with cheap supplies you can find at your local dollar store or Target’s Dollar Spot. Turn ordinary water play into a fun sensory activity by adding some baking soda and vinegar. Kids will love mixing up some fizzy Love Potions for Valentine’s Day. All you need to create this simple Valentine’s Sensory Bottle is some colored rice, pom poms, and little heart beads. When you’re done with it, dump the contents in a small bin with spoons and measuring cups for a simple sensory bin. Mix some cornstarch and shaving cream, pop it in the freezer, and you have the perfect Frozen Sensory Dough for Valentine’s Day. Your little guys will love excavating hearts in this Construction Play Small World. Digging and scooping is the way to my boy’s heart. How about yours? 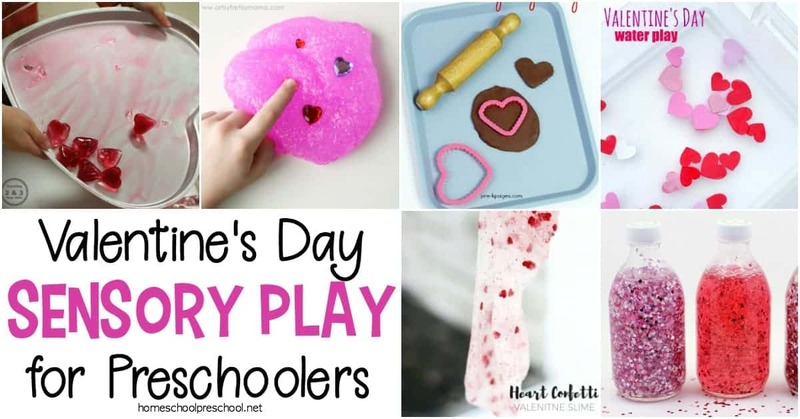 Kids will use their imaginations in this open-ended Valentine’s Day Playdough Invitation to Play. 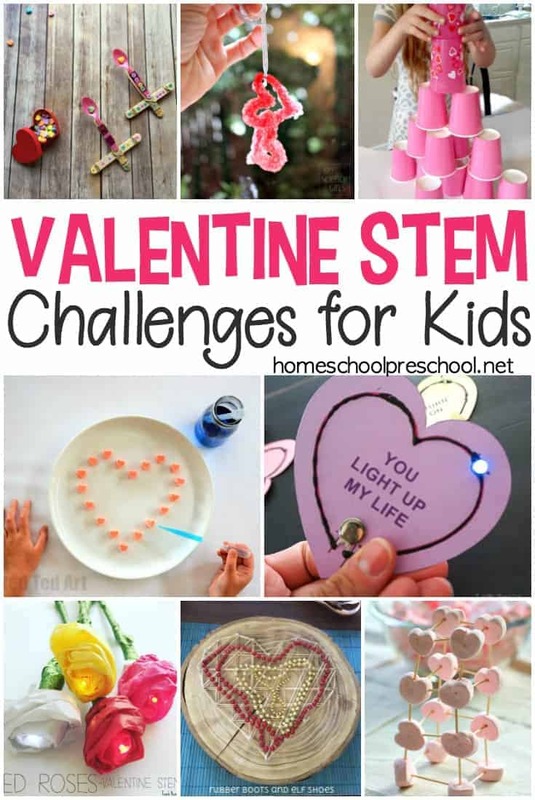 Let’s work on fine motor skills with a fun Valentine Themed Heart Button Snake. Perfect for little hands! Glitter with no mess? Yes please! That’s just what you’ll get when you make these Heart Glitter Jars for Valentine’s Day. Kids will love the sparkles. Moms will love no mess. Fill a bowl or bin with Valentine-themed loose parts, and you’ll have created the perfect Valentine’s Sensory Tub for Toddlers! Twenty amazing ideas. Each one better than the last. 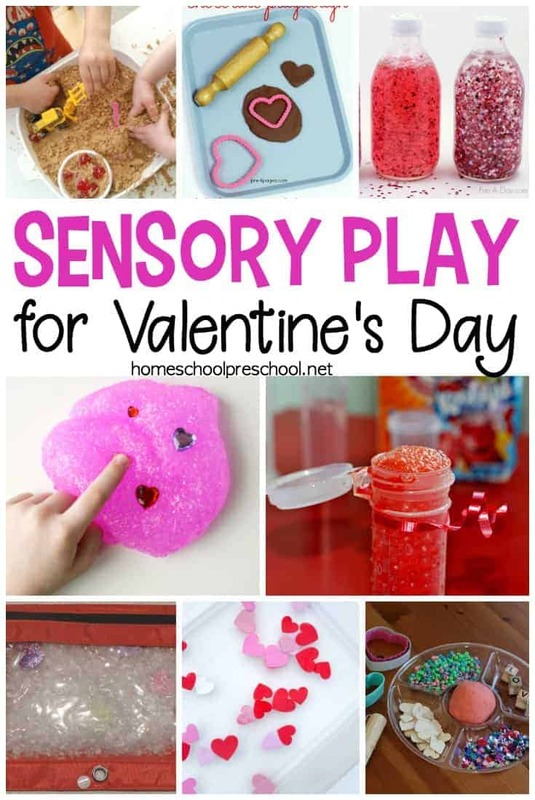 Which of these Valentine-themed sensory activities for preschoolers will you try first?